The Air-Launched Miniature Vehicle (ALMV) was the primary American ASAT effort in the early 1980s. This weapon, launched from an F-15 fighter by a small two stage rocket, carries a heat-seeking Miniature Homing Vehicle (MHV) which would destroy its target by direct impact at high speed. 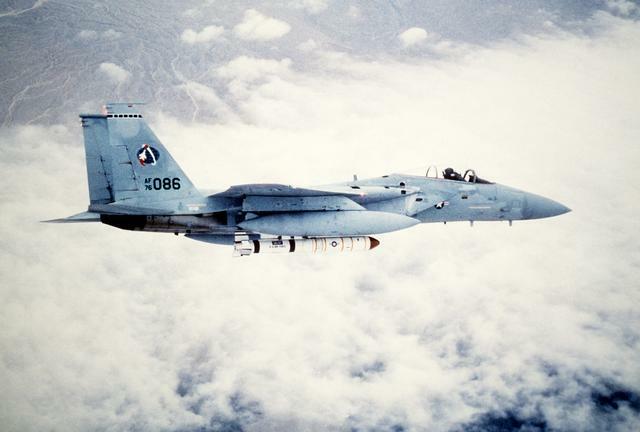 The F-15 can bring ALMV under the ground track of its target, as opposed to a ground-based system, which must wait for a target satellite to overfly its launch site. An operational force was planned to ultimately number over 100 interceptors. However, by 1986, the program, initially expected to cost $500 million, was estimated at $5.3 to complete. 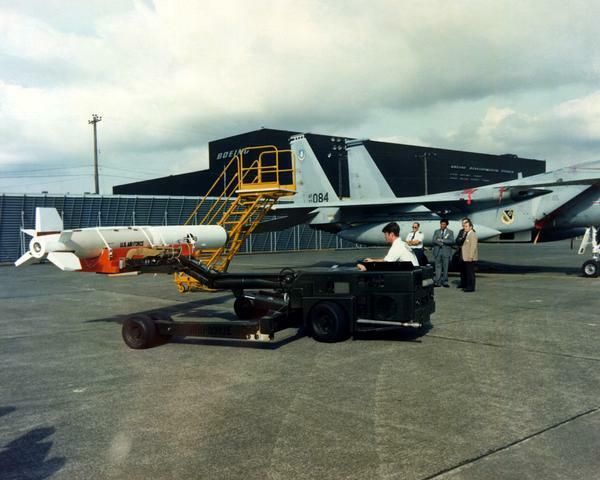 In an attempt to limit costs, the Air Force scaled the MHV program back by 2/3 in 1987. The Administration canceled the program in 1988 after encountering technical problems with its homing guidance system, as well as testing delays and significant cost growth. In the mid 1970's it was estimated that at least three fourths of the satellites in space were being used for military purposes. The Soviet Union was known to have a satellite killer as early as 1971. The United States decided to also develop an anti-satellite capability in the event that it was necessary to control the military space. 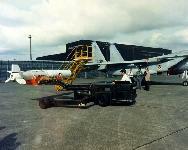 The ALMV ASAT was developed by LTV Aerospace for the United States Air Force Space Systems Command during the period of 1977 to 1988. 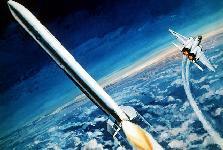 The missile was designed to destroy satellites in earth orbit at altitudes of 350 miles or lower. The ALMV ASAT was launched from the fuselage centerline of the F-15 aircraft. The ALMV ASAT had three stages. The first stage was designed by Boeing as a subcontractor to LTV and was powered by a SRAM solid rocket motor. The second stage was designed by LTV, and carried the inertial guidance package, the third stage, and a liquid helium system to cool the third stages' infrared sensor. A hydrazine attitude control system was used to accurately point the third stage at the targeted satellite. The third stage, also designed by LTV, was called the miniature kill vehicle (MKV). The MKV consisted of an infrared sensor, a guidance computer, a roll reference sensor, and solid rocket motors for maneuver and attitude control. All of the subsystems of the MKV were very unique miniaturized designs. For example the MKV's computer only weighed 0.8 pounds and had 24,000 bytes of capability. There were 63 maneuver motors located around the circumference of the vehicle. These 0.5 inch diameter 20 inch long tee shaped solid rocket motors were so powerful that each developed 10,000 PSI pressures in their 0.1 second burn time. Mission planning was performed in the Cheyenne Mountain complex in Colorado. The F-15 was vectored to the correct launch coordinates and launch time. 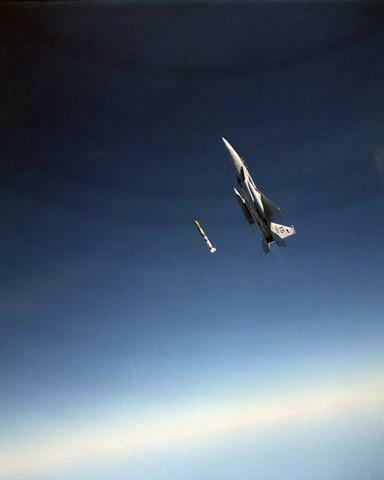 At the correct location and time the missile was launched from the F-15 and the first stage propelled the missile to a precise inertial point in space so as to be on a collision path with the targeted satellite. The second stage pointed the third stage at the satellite so that the infrared image of the satellite could be detected by the MKV sensor even though the satellite was hundreds of miles away. The MKV was spun up to 33 revolutions per second. The spinning MKV used the known spin rate to keep track of it's attitude. The spinning infrared sensor maintained track of the satellite and reported the satellite's position to the guidance computer. The guidance computer calculated the maneuver required to keep the satellite in the cross hairs of the sensor. The MKV solid rocket motors were then commanded to fire at a precise time to accomplish the desired maneuver. This process was continued repetitively until the MKV collided with the satellite destroying it by virtue of the extremely high kinetic energy. Typical closing velocities for satellite intercept was 15,000 to 25,000 miles per hour. When the 30 pound MKV collided with a 2,000 pound satellite at closing velocity of 15,000 miles per hour complete destruction was assured. The ASAT system concept required a very accurate sensor, precise computations, and timely maneuver commands. The system was successful in its first flight test against a real satellite on September 13, 1985. This Friday the 13th event was definitely a good luck day for Vought. An active US satellite orbiting at about 290 miles above the earth was selected as the test target. 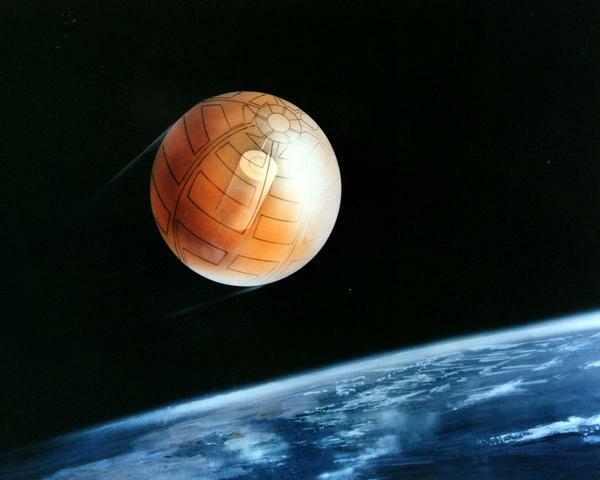 The target was a 6.8 foot diameter, 1,874-pound satellite known as P78-1. The MKV destroyed the satellite, hitting it within 6 inches of the aim point. The Air Force described this test as "flawless". This test demonstrated the "hit to kill " technology providing the basis for several future Vought missiles.